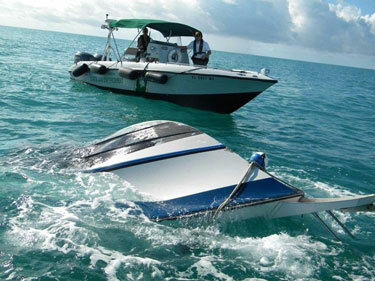 Boat Accident Lawyers in Port St Lucie, Fort Pierce FL. Here on the Treasure Coast of Florida we are surrounded by water and the boating lifestyle is enjoyed year round. Nobody ever thinks they will have a horrific day on the water, but anything can happen at sea! Boating Accidents are on the Rise in Florida. After a better year in 2016, according to the Florida Wildlife Commission, reportable Florida boat accidents were again on the rise in 2017 and reached a record of 766 reportable accidents. In 2017 alone, there were 67 deaths and 437 injuries. According to the U.S. Coast Guard Boating Safety Division, Florida is the most dangerous state in the country in terms of fatal boat accidents. The number one cause of death in boat incidents is “falling overboard.” In 2017 in 52% of cases the cause of death was drowning and in 43% of cases the cause of death was trauma. Will Boaters Insurance Cover Accidents and Injuries? Some people mistakenly believe boats are covered under standard Homeowners policy. Depending on the policy terms this might be true for small boats, like a canoe, and for very limited coverage, but there are limitations. A responsible boater should have boat insurance which, similar to car insurance may cover for injuries which occur in the operation of a boat like medical bills, pain, suffering, and lost wages. 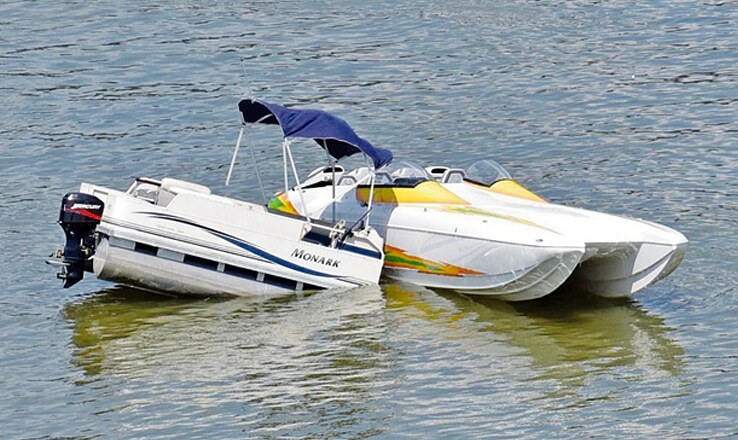 The first thing anyone should do when involved in a boating accident is to stop the vessel immediately, if the vessel can be safely stopped without causing more danger. Second, you should give assistance to anyone injured in the accident. Of course where there is serious injury, or a severely damaged vessel, you should use your radio, another person’s radio or mobile phone to call for further assistance immediately. Finally, parties involved in a boating accident should exchange names, address, and indentifying numbers of the vessels. It is also a good idea, if possible, to take photos in order to be able to demonstrate later how the accident happened. Do I have to report the Boating Accident to the Authorities? Generally, yes; unless the incident is very minor. In Florida, vessel operators involved in an accident must quickly report the accident whenever there has been: 1) death or disappearance of a person, 2) an injury to a person that required medical attention beyond first aid, or 3) vessel damage or property damage of more than $2,000 The accident report should be made to:1) the Law Enforcement Division of the Florida Fish and Wildlife Conservation Commission (you can dial *FWC from a mobile phone), 2) the sheriff of the county where the accident happened, or 3) the police department of the municipality where the accident happened. If you fail to report an accident or fail to render aid to people who need help, you can be charged with a criminal offense. What are typical causes of Boat Accident Injuries? Safe operation of boats must always be done in compliance with International Regulations for Preventing Collisions at Sea, 1972 (72 COLREGS) or the Inland Navigation Rules (33 CFR 83). Every operator should be familiar with these “rules of the road” for boats. In particular Rule 7, Risk of Collision, Rule 8, Action to avoid collision, and Rule 14, Head On Situation. We see a lot of operators disobeying these rules here in Florida, especially Rule 14 which says that: “unless otherwise agreed, when two power-driven vessels are meeting on reciprocal or nearly reciprocal courses so as to involve risk of collision each shall alter her course to starboard so that each shall pass on the port side of the other. Similarly, we also see frequently that operators violate Rule 8’s requirement that any alteration of course and/or speed to avoid collision shall be large enough to be readily apparent to another vessel observing visually or by radar; a succession of small alterations of course and/or speed should be avoided. When two vessels collide the fault for the accident will be determined using these maritime rules of the road. A person who fails to keep a proper lookout, or does not uses proper port to port passing in head on situations, or fails to make his alterations to course large enough and obvious enough to other boaters can easily find himself in a collision situation and be responsible for any personal injuries or property damages that result from his negligence. Fires do occur on boats. This is why the US Coast Guard mandates that vessels less than 26 feet carry 1 type B fire extinguisher. Vessels between 26 feet and 40 feet must have either 2 type B-I or 1 type B-II fire extinguishers unless they have a an approved fixed system and vessels between 40 feet to 65 feet must have either 3 type B-I or 1 type B-II and type1 B-I, unless they have an approved fixed system. If a fire erupts on your boat, you may have very little time to respond. As with any emergency, it is important to make sure everyone onboard is wearing their lifejacket (PFD) so that if the boat must be abandoned, all onboard are ready to go. It is generally recommended that you position your boat so that the fire is downwind and if the fire is in the engine, to shut off the fuel. You should follow the proper procedures for your fire extinguisher and aim at the base of the flames. Someone should also immediately summon help on the radio. Fires can cause devastating personal injuries whether they are on land or sea. If you or someone you love was injured in a fire, it is best to consult with a personal injury attorney, rather than try to deal with any insurance companies without any help. 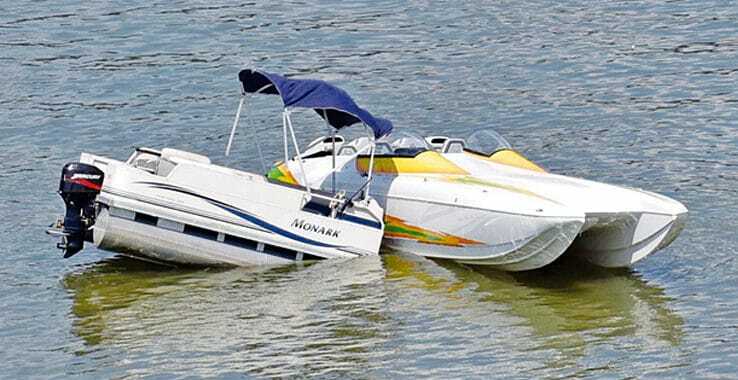 Motorboat propellers can cause devastating personal injuries. Not only does the strike itself cause severe mechanical damage to the body but the fact that it occurs in a marine environment means that there will be contamination of the wound by marine organisms. Propeller injuries can occur when passengers fall over the bow or when someone climbs on the swim platform while the boat is in gear. People can be injured when a boat operator foolishly tries to reverse towards a skier or anyone else in the water. It is critical that any operator stay well clear of any diver down flags as required by Florida law. Of all of the types of personal injury accidents that can occur on a boat, accidents involving propellers may be the most terrifying. Propeller accidents produce truly catastrophic injuries or death. If the victim survives, it will likely be with lifelong pain and disability. It’s fun to go fast on the water. But operating a boat recklessly can lead to a personal injury or a wrongful death. In Florida, when driving a boat the law says that a person who operates a boat with disregard for the safety of persons or property at a speed or in a manner so as to endanger life or limb or damage property of injure a person is guilty of reckless operation of a vessel which is a misdemeanor in the first degree. F.S. 327.33 Reckless or careless operation of vessel. Safely piloting a boat is difficult enough without the added distractions which come with our modern ‘always connected’ lifestyles. Texting, talking on the mobile phone, emailing, or playing music on the boats radio through the handheld devices are some of the activities that boaters now try to do at the same time they are operating the boat. Rule 5 of the International Regulations for Prevention of Collisions at Sea (COLREGS) provide that every vessel shall at all times maintain a proper look-out by sight and hearing as well by all available means appropriate in the prevailing circumstances and conditions so as to make a full appraisal of the situation and of the risk of collision. The same rule applies to inland waters as well. For personal watercraft (PWC), like Jet Skis and Sea Doos, the Florida Wildlife Commission found in 2016 there were 151 accidents with 11 deaths and 141 injuries. PWC like Jet Skis and Sea Doos can be particularly dangerous. This is because they have no natural braking mechanism. Unlike a powerboat with a propeller/rudder in the water, a PWC coasts to a stop with no ability to reverse and no ability to turn while coasting. Basically, when the operator has a surprise and drops off the throttle, he has no control of the vessel from that point until it naturally stops. Steering loss is a frequent cause of personal injuries and accidents which occur involving PWC’s like Jet Skis and Sea Doos. Injuries are also frequent on PWC’s because, unlike a boat, the driver (or passenger) is not protected by any enclosure. Riders can be easily ejected which can lead to worse injuries when there is a PWC crash as compared to a boat. An experienced personal watercraft accident attorney or boating accident attorney can help evaluate your case when there has been jet ski injury or PWC accident. The majority of the time that wrongful deaths involving a boat occur (67%), the operator has not taken any boater education course. In Florida, anyone born on or after January 1, 1988 who operates a vessel powered by 10 horsepower or more must pass an approved boater safety course and have in his/her possession photo ID and a boating safety education identification card issued by the Florida Fish and Wildlife Conservation Commission. You can locate a Boater Safety Education course near you by checking the US Coast Guard Auxiliary website here. Some of the topics that are covered in the Boater Safety Education course include safety equipment, the maritime rules of the road, and the meanings of navigational aids. By receiving at least this bare minimum of education, a boat owner or operator reduces the chance that he might cause an accident or injury while boating. An experienced personal injury attorney can assist in determining if a boat involved in a personal injury claim was negligently entrusted to an operator who lacked the necessary experience and education to properly navigate the boat without causing an accident. Around 25% of the, time alcohol or drug use is a contributing factor in boating accidents. It is a violation of Florida law to operate a vessel while impaired by alcohol or drugs. A person is presumed to be under the influence if the person has a blood-alcohol or breath-alcohol level of 0.08 or more. For a person under the age of 21, it is unlawful for a person who has a breath-alcohol level of 0.02 or higher to operate or be in actual physical control of a vessel. A personal watercraft like a Jet Ski or Sea Doo is considered a vessel and may also not be operated while impaired by alcohol or drugs. Similarly, in Florida it is against the law to use water skis, aquaplane, or us other similar similar devices from a vessel while intoxicated or under the influence of any narcotic drug, barbiturate, or marijuana, to the extent that the person’s normal faculties are impaired. Sadly, alcohol is often a factor in boat accidents with personal injury. When it comes to cars, everyone knows that drinking and driving impairs your ability to perform basic tasks such as steering the car or reacting quickly enough to a hazard. But the same is true with boating and boating under the influence may be even more dangerous. Unlike a car, where when an accident occurs there is a seat belt and air bags to protect the passenger, with a boat, passengers are more easily ejected. In the case of passengers who are knocked unconscious, are poor swimmers, or are themselves intoxicated, drowning is a real possibility. A skipper who is himself intoxicated is unlikely to be able to perform necessary and legally required rescue. If you or a family member was injured in a boat accident where alcohol was a factor, it is important that you speak with an experienced boat accident attorney right away. In 81% of fatalities the victim was not wearing a personal flotation device (PFD). The United States Coast Guard sets minimum standards for recreational vehicles and safety equipment. To meet these standards, required equipment must be U.S Coast Guard “approved” or “certified.” All recreational vehicles must carry one wearable life jacket for each person onboard. Any boat 16 feet and longer (except canoes and kayaks) must also carry one throwable (Type IV) device. Life jackets should be worn at all times when a vessel is underway. On a vessel that is underway, the Coast Guard says that children under 13 years of age must wear an appropriate life jacket unless they are 1) below deck, or 2) within an enclosed cabin. Florida law provides that a person may not operate a vessel less than 26 feet in length unless every person under 6 years of age on board the vessel is wearing an approved PFD while the vessel is underway. A life jacket can save your life but only if you wear it! While a failure to have sufficient personal flotation devices (or other required safety equipment like a whistle, proper navigating lights, flares or fire extinguishers) onboard may not cause an accident, they can certainly make the situation worse when an accident happens. It may be negligence for a boat operator to fail to carry these required safety devices onboard and if this negligence contributes to an injury or accident, the boat operator may be liable. The Law Office of Todd C. Passman handles maritime and boat accidents in Fort Pierce, Port St. Lucie, Vero Beach, Stuart, and Okeechobee, Florida, and surrounding areas. If you, a family member or a friend have suffered a personal injury in a boating accident or maritime case, or have questions please contact Todd C. Passman today, at (772) 465-9806 or or fill out the contact form on this page. Someone from our office will contact you right away.